With this issue of the Herald-Review commences the publication of a department devoted to the mining operations and the mining development of this section. To make this department a success, accuracy is essential. It will be insisted upon and information that is published will be secured only from reliable sources. It is the aim of the publishers to print not only facts that are interesting to mining men, but to the general public as well. Everyone is interested in mining activities of the Iron Ranges. Few realize their great extent and know of the tremendous expenditures of money and energy used in the exploitation of this great source of wealth. Thus the Herald-Review asks for the co-operation of those interested in mining and of the general public so that this feature of our rapidly growing publication will be of real service and of genuine interest. Because of the size of the operation and the methods used in removing overburden, the work on Section 16, known as the Hill Annex mine near Calumet, Minn., is of interest to everyone who is concerned with mining development. Section 16, which is that section of Township 56, Range 23, has a large deposit of ore. This is property leased from the State by the Great Northern Iron Ore properties and proceeds accruing from this lease will go into the school fund of the State. The ore will be removed by the Arthur Iron Mining company, of which B. M. Conklin is the superintendent and L. G. Bonesteel is chief engineer. The contract for stripping has been let to Gutherie & Co., prominent railroad and mining contractors. Their contract calls for the removal of 8,500,000 cubic yards, the largest single contract ever let on the iron range. Robert M. Knox is the superintendent of operations of the Guthrie company. Mr. Knox is well known in this section as he had charge of building the Nashwauk-Gunn Junction extension of the Great Northern railroad seven years ago. Of special interest to those engaged in mining is the equipment used in the completion of this great contract. It is probably the most complete ever assembled under like conditions and in it are embodied the latest theories formulated by contractors for mine stripping. The most noticeable thing is the absence of the small equipment of cars and engines which were formerly used in such operations. The small locomotive or "dinky" is not to be seen. Only the larger type are here used. The Guthrie company has twelve locomotives on this job. The largest is a ten wheeler, seventy ton Baldwin, used on the Jordan Spreader of which mention will be made later. 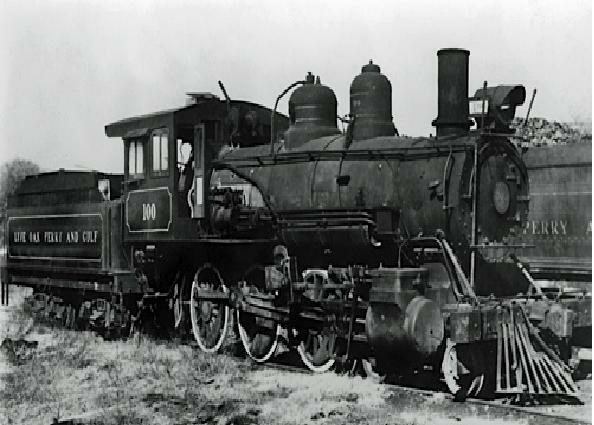 There are six locomotives of the 0-6-0 type, each of sixty-seven and one-half tons weight with a twenty by twenty-six cylinder. These are as heavy, if not heavier than any other locomotive used in stripping operations on the range. Though they are heavy, they have a very short wheel base, about one hundred twenty-nine inches and thus not much longer than that of an automobile. In addition to the six large locomotives there are two fifty-ton locomotives used on dirt trains and two small 4-4-0 Standard locomotives used exclusively for switching purposed. The car equipment consists of seventy Kilborn & Jacobs automatic air dump cars of sixteen and twenty yard capacity. All the equipment is standard gauge. The rail used is of eighty-five pound weight. Over ten miles of track has been laid and in constant use. Three Marion shovels are utilized in removing the dirt. Two are of the Model 76 type, of four yards dipper capacity, the other is a one hundred thirty-five ton Model 100 Marion of a five yard capacity dipper, the largest shovel made and of astonishing digging capacity. The efficiency of these shovels is unquestioned. Despite the fact that nine double shifts were lost in June due to heavy rains over 300,000 yards of dirt were removed and the same amount has been removed in the period from July 1 to 22. This is said to be a good record, especially when we consider the material which is of a heavy clay and boulder class. The experience with heavy equipment shows that the older method of removing overburden by the use of small shovels, engines and cars will doubtless be abandoned. Completion will demand it. The shop of the Guthrie company is also completely equipped. It is housed in a building 40x130 feet. It has two engine pits and a complete outfit for repairing. Large lathe and shaper, wheel press, bolt cutter and drill are among the features which are common to this and to other shops. Power is obtained from a 2400 volt, sixty watt generator. The current is cut down to 220 vols for small motors and 110 volts for lighting. A huge compressor is operated by a 2400 volt motor. Another piece of equipment symbolic of the new methods in stripping operations is the Jordan Spreader. It is used to clear the dirt away from the tracks on the dump. There is considerable dirt which remains between the tracks and the edge of the dump which if not cleared will cause trouble. 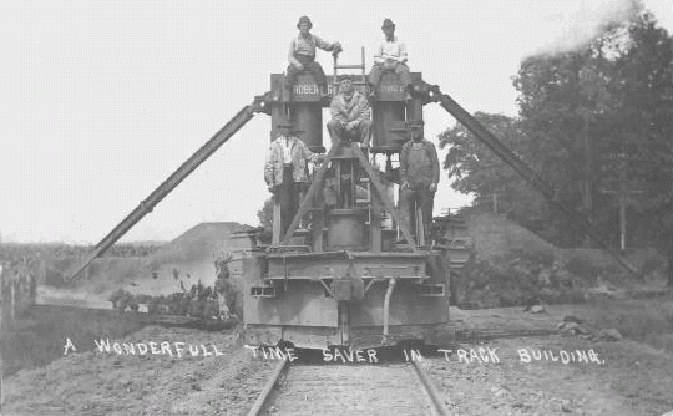 Usually this is done by hand, but the Guthrie company has followed the methods in use in the railroad constructing and has brought into use the spreader which will clear away any dirt completely to a 1912 of 2,000. The average daily production per man depth even with above or below the level of the track and does this work at the rate of about three minutes for a train load . The dirt is scraped away by a wing or phalange which is let down from the side. The machine is pushed by the big seventy ton locomotive. But the most important thing to be considered here is not the mechanical construction of this great labor saving device, but the very fact that it is employed in the stripping operation is most important. If time and space permitted, other interesting features of this equipment might be discussed. The Hill Annex mine however is typical in its equipment for the new methods employed in removing overburden. The general trend in the last few years has been towards the use of heavier machinery of larger capacity and the Guthrie company has simply carried the policy to a further extent than have other contractors or mining companies on the range. One can well imagine the extensive use of labor- saving machinery, when it is considered that 345 men are employed when these operations are at their full capacity, and of these 345, probably one-third are above the class of common laborers. 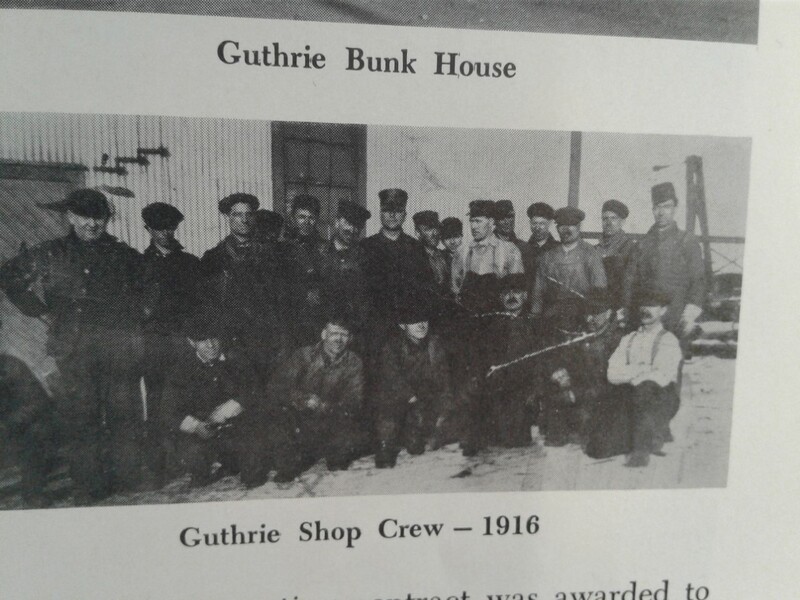 The common laborers are of foreign nationality and take care of themselves in their own way, and in their own camps, but for their other employees the Guthrie company has built complete rooming and boarding houses. These are models of their kind and as the operations are to last for a period of at least four years, permanence in construction is one of their characteristics. There are two bunk houses, each with a capacity of 120 men. There is a room for every two or three employees and both buildings are equipped with steel spring beds. There is hot and cold water, steam heat and electric lights. The buildings are models of cleanliness. Near the bunk houses there is a bath house, containing twelve shower baths. Close to this group of buildings is the large dining room, capable of seating 220 men at once, six to a table. Off the dining room is a completely equipped kitchen fitted out with three hotel ranges on concrete floor. The kitchen is a very well regulated and sanitary one. Near the kitchen is a store house and cellar capable of holding two months supplies of all foods. An ice house in dimensions 24x24 with a meat cooler ten feet square, is in another building. The office building consists of one two story frame structure. On the first floor there are four office rooms and on the second floor living rooms for the office force. All the buildings are grouped on a high piece of land and the grounds are well drained. Water is furnished from a sixty foot tower and the camp has complete sewerage system and a large septic tank. Everything is well constructed from a sanitary standpoint. But the stock raising activities of the Guthrie company are also interesting. There is an excellent stable and in it are housed eight of the finest horses in the north. Sixty seven pigs of various ages and breeds are kept in the large enclosure south of the stable, all of them growing up to constitute a saving in the meat bill. The pigs seem to enjoy the industrial activities of their immediate community and thrive and grow as only Northern Minnesota pigs do. The Guthrie company recognizes, as do all the other industrial institutions of permanence, that the better the living conditions, the more satisfactory the results. It is thus their intentions to maintain their camps in excellent condition, to provide good food, to maintain order and do all that is conducive to health and happiness. The work on Section 16, is not only interesting from the standpoint of the miner and the engineer, but its many phases are also interesting to the general public. 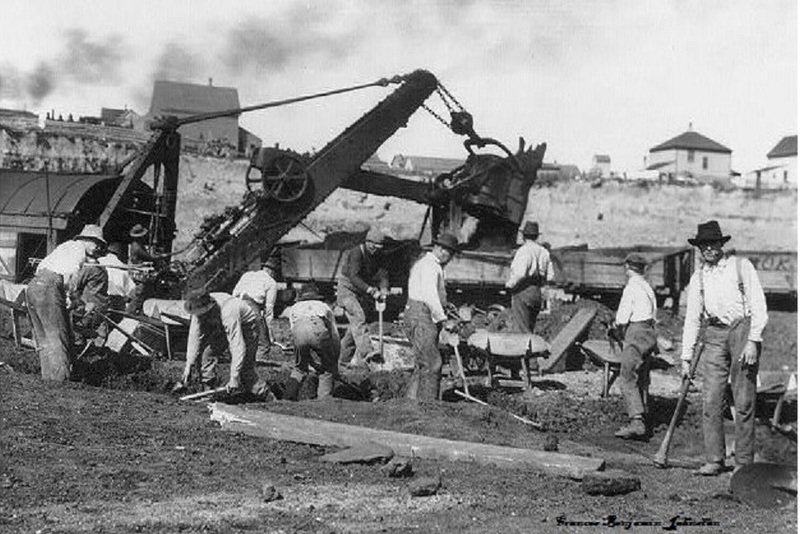 It is thought that the Arthur Iron Mining company will begin the shipment of iron ore sometime during the next season. Section 16, is to be one of the Mesabi range’s greatest producers. Please refer to this most informative web sight for an in depth overview of the Historical Tour at the Hill Annex. The pictures are not period correct in all cases. Please review the above picture. 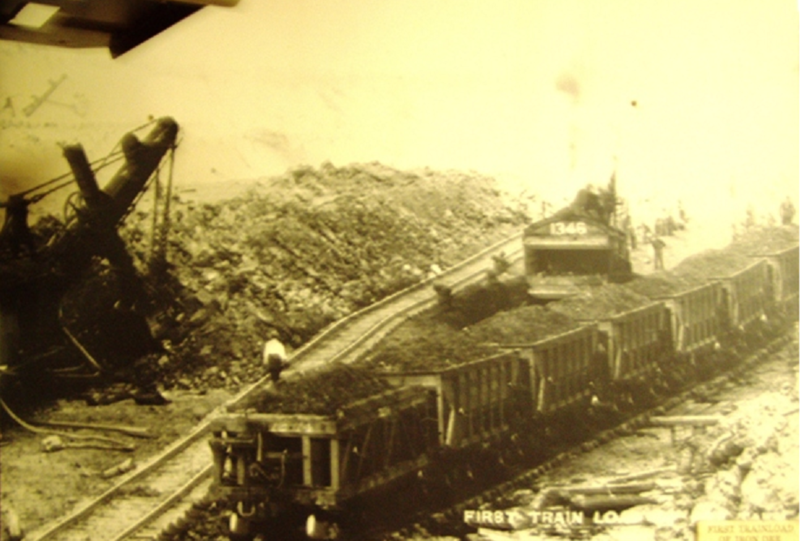 This is a picture of the 1st train load of "Merch (merchantable) ore (also called natural ore) shipped from this mine. Also take note of the Pit Boss in the white shirt. He was also referred to as a "Pit Walker". The only transportation into and out of the mine was by rail or stairway. Workers would have to take a long walk up or down the stairs that started out at the mine office(It is said there were over 300 steps w/ a landing every 100 steps at the end of the train era). There was also a railroad "Speeder Car" that was used to bring supply's into the mine. Personnel were only carried by speeder car if injured or sick. In the early days of iron mining Immigrant workers were pitted against other nationality groups to increase production, and many times were paid much different. Today there is a very diverse workforce and although the old ethnic jokes still are told, a single crew working together might consist of each worker from an ancestry of different ethnic parentage. We are all American's working together for a common cause today. Unions are looked down on by many today. Back in the early days a worker might be required to give up half his pay to a unscrupulous boss and story's are told of mine superintendent's making a visit to a workers home and claiming a pig that was being raised by said family to supply them with winter meat, to be butchered and delivered to his home or there wouldn't be a job for him the next season. Work was seasonal except for a skeleton crew for maintenance and stripping up to the days of Modern Magnetic Taconite mining. In the early years workers making $2.00 - $3.50 cents a day would have to subsidize this wage by farming, logging or trapping to make it until the next ore season and hope to be re-hired. Union contracts made job security a priority. Unemployment Insurance began in 1935. This helped workers make it through the long winters. For many workers this was still a very lean time. Union contracts brought in payed Vacation's, Medical insurance, retirement benefits and Sub pay (Supplemental Unemployment Benefit). Sub pay started in the 1950 to help a worker further through long unemployed winters and was instituted in lieu of a wage increase. One could say that you could just put some money away which works for many, but some family's suffered because of the inability to save for many different reasons with alcoholism being one. In the 1980's the Modern Taconite industry faced some difficult times and layoffs were becoming common. Sub pay was capped at 1970's level and after dividing those dollars out to thousands of unemployed miners the funds ran out after 1 or 2 weeks. These plans were then re-visited in Steel Worker contracts. One thing that union workers want the World to know is that, What we and our forefathers fought for have been enjoyed by many that never had to fight for the same. Union contracts in the 1930 workers would be paid per hour of work at rates of 30-50centsper hour of work and 8 hour shifts. By the 1970's the wages reached $5.00 per hour depending on job. Today wages average about $30.00 per hour for equipment operators plus full benefit package and profit sharing plan. When I question myself, Why did I retire early? I find solice in the fact that a young person is now employed in my place. Is the history of the State agency founded back in 1949 by MN Governor Harold Strassen. You will learn more about the taxation of iron mining in MN and what lead to the Taconite Amendment. This above link is to an article from an early 1911 Hibbing News Paper, "The Mesaba Ore"
The bucket hoist is power raise and gravity lowered. The hoist lever is pushed forward for hoist operation which is different from the Power Shovels of today. The swing is lever actuated and when electric power shovels came into common use the swing (slewing) was controlled by foot pedals. In moderen day shovels this would be a side to side movement of a joy stick. On some steam shovels, the slewing actuators are vented below the counterweight, but sometimes all revolving frame actuators are vented out the boiler stack. Venting out the stack works like a draft inducer increasing inflow of combustion air into the boiler resulting in extreme power. The "Crowd" operation(forcing the bucket out into the bank) is also a one way powered function. The operator would need to release the crowd to coast back towards the boom before lowering the bucket. The vented steam would be piped to the top of the boom and vented to prevent obscuring visibility. Today all crowd functions are powered both ways to the point there an electronic monitoring system is designed to limit the amount of crowd power possible by monitoring hoist amperage. In this way the rubber V-belt's driving the crowd machinery would last longer. All functions on modern day power shovels are monitored and managed by the use of computers. An operator today is used to the computer or a limit switch that reverses, or stops a function before any machinery reaches a hard stop. The History Channel did a documentary on Power Shovels a few years back under the sub-title, "Extreme Engineering-excavators" This can be found on the Youtube (scroll up 1 page Link is there with History Channel behind it). This was shown on TV for the past ten years and every once in a while I will get a call from family or friend across the country that was watching that documentary and saw "Yours Truly" interviewed. This was a great honor to be a part of that show. 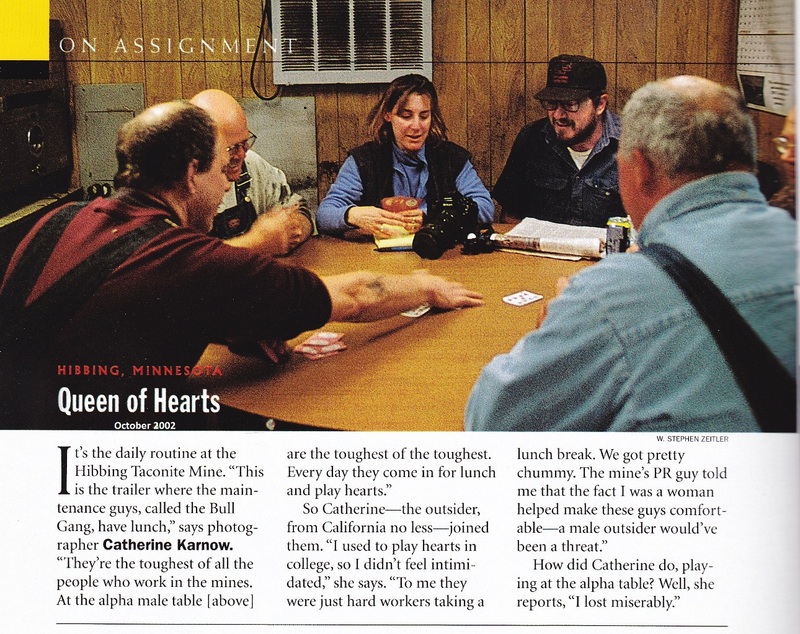 Another unique event in my 34 years in mining was when "National Geographic Magazine" was at our mine during a Zip Code USA department profile in October 2002. 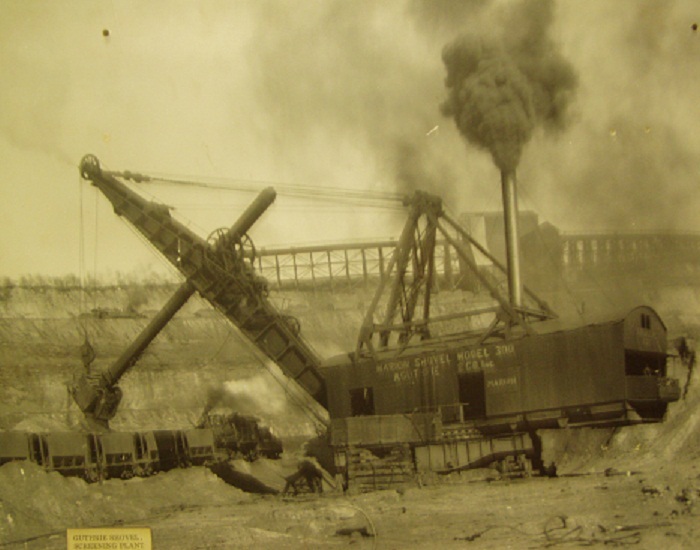 Hibbing MN 55746 was drawn and with Hibbing Taconite Co., being the largest employer in the Hibbing City limits a portion of the article was done at the mine. I made it into that magazine also. Everyone pictured is now retired and for an example, one of the workers in the picture grew up in a small "Location" house right where the pit is located today. When Hibbing Taconite started in 1974, houses from Pool Location were sold and moved away. 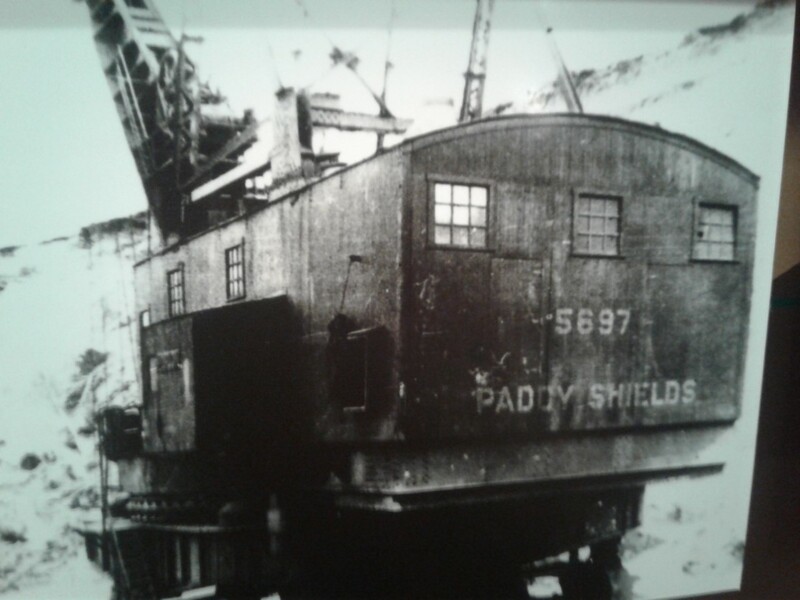 The stripping was done with a D8 Caterpillar Bull Dozer because the ore body was so close to the surface to the point that very few if any home had running water or indoor plumbing and it was not unusual for a "Outhouse"(out door toilet (Privy)) to be placed on a mound because the ore being Magnetic "Taconite" (Magnatite)is a solid hard rock formation. I used the word placed because usually every year a Toilet had to be moved to a new location where a new hole would be dug and the toilet building placed over the hole, but here another mound would need to be built for toilet placment. 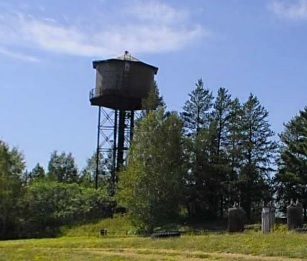 The City of Hibbing would deliver water to each house and a cistern was a common way of storeing water until the truck came again. The day the truck came was bath day. Water was heated in 4-5 gallon boilers on the kitchen stove. Bath water wasn't drained for the next in line to bath either! and this up into the early 1970's. After being discharged from the US Army in the spring of 1974 with a training certificate from the Kansas State university, Manhattan i was looking for a job in Law Enforcement but without employment I applied for work everywhere applications were being accepted. Jones & Laughlin Steel in Calumet Mn was the first employer to call. I had opted for a 90 day early discharge in order to get a job before the students filled all the summer positions with the requirement that i spend a year in the National Guard. My first day on the job as a entry level laborer i was introduced to shovel electrical cable. We had to load a 1,000Ft length of 4,160 volt 1-3/4" dia. cable (some called this pulling sausage among other names)into a cable boat in a figure 8 pattern. This was a grueling task and the operator of the large road grader pulling the cable boat was watching closely how a couple of us Greenhorn Miner's were holding up. Old Frenchy saw we were tiring so he started to speed up a bit and when we finally saw his shoulders through the rear window of the grader bouncing up and down we knew we had been had! The arms were heavy after that day and after many more days spent shoveling debris from under the 100's of feet of conveyor's on top of the "Float Reject" pile. It was evident that one would have to POST for every job Posting to get away from the No.2 shovel. Working afternoon and night shift was a much more relaxed shift spent cleaning up spills in the Heavy Media Plant. The 1 inch washdown hose was much more pleasant than the No.2 shovel. One thing I learned early on as a plant labor was the difference between the sections of the ground floor in the plant. When assigned to clean one section one learns not to do the same in the next unless told! One afternoon while hosing the floor in the Lind Greenway Plant (the L-G was a Sister Plant to the Hill Annex located just North of Grand Rapids) I had finished the assigned section and figure I would just move over to the next and start cleaning. Well after about 20 min of hosing, the Heavy Media Operator came running down the stair's bellering for me to STOP! The Heavy Density operation is charged by hosing the Ferrosilicon (ground up pig iron) into the sump in the floor of this section of the plant ground floor. All Ore was floated out to the reject pile for the next couple of hours until the Specific Gravity of the fluid in the Separator was brought back to about the 3.5 level. After a good scolding and watching the process I never made a mistake like that again! Most of the incidents told in this article will be a memorable event that after 38 years are easily recalled. My first posted job was that of Car Rider. This was an exciting new job. I had watched others doing this Fun Looking job. We worked with a partner and our job mainly consisted of breaking apart a string of 80 ton ore cars into pairs and riding the car as it rolled down grade to the load out pocket's. Our job required us to hand operate the brakes on the ore cars by 1st, setting the hand brake on a lead car then pulling the coupling release behind the cars to be moved. The railroad would have all car brakes set pneumatically and we would have to bleed the air off the cars we were moving them while standing on the brake platform with our waist safety belt hooked to the car we then released the hand brake, their were two different hand brakes in use on the ore cars. one had a quick release action were the brake would be instantly fully released and we would have to quickly take up the slack to control car speed, the brake I liked the best would just release the hand wheel and one could get control of the cars much faster. Then there were times when the cars wouldn't roll when the brake was released and that was what a partner was for, he would use a special pinch bar to get the car rolling,BUT, more often we would just push the cars apart with our legs and our back against another car to get them rolling and then climb onto the moving car. Of course this also was not proper but that's what happens when the boss isn't watching closely. Under the pocket we would have to spot each car to be filled by the load out operator with either Course Ore or Fine Ore. During a typical 8 hour shift we might load 50-60 car loads of course ore and 7-10 cars of fine ore. We would also have to seal all the fine ore cars so they wouldn't leak ore and plug up the load out track. In the past hay was used but we used pulp bark, a waste product of the paper mill in Grand rapids. A fine's car was sealed with a bucket of approx. 2 yards of poplar bark that had to be spread out into all corners in the bottom of the car. We used a pitch fork to spread the bark and would then toss the fork into the next car then run up the inside of the car and jump to the next, sliding down into that car with caution as the pitch fork is also in their. During the Grave Yard shift the few yard lights around the track left many shadows to hide that pitch fork! We would also have to stage cars for the course track. The one thing that wasn't well planned on the upper track car storage was the number of cars held on the fine side. It was out of proportion to what was needed on the course side, so we would have to drop strings of 6 cars down off the fine side and push them back up onto the course track a couple times each shift. We had an old Euclid power unit with a large front bumper to push these cars around. One time when working an overtime shift with another car rider I had never worked with, we lost a string of 6 ore cars! All six cars went to town all by themselves! There is always a de-rail device on this spur line just down the track just for things like this, but the run away cars apparently broke that devise, although its possible the derail wasn't set that day however the railroad crew stated it failed. We made a panicked call to the railroad depot in Calumet reporting the run-away cars. All I could think about was my old friend Harold Krantz whom I would enjoy visiting as he was a neighbor to my Foster Parents back in Deer River, well Harold would walk up the Hill Annex Spur from the main line into the mine before the empty car's would be brought in throwing switches and derails. I was, I want to say, Praying but this was a long time before my relationship with the Lord and therefore I was certainly hoping Harold wasn't on his walk up the track this night. Well as it turns out the cars were found sitting on the main line down by Snowball Lake and no damage was reported. The next time I worked with that same car rider I was the one who made the big mistake! We were both on overtime that morning. Doubling from Night's to Day's was always the hardest overtime shift! Well this was my 1st time dropping cars at the Cretaceous Plant. This was a little Benification plant built to process the Cretaceous ores that were stock piled back in 1916-17. This is the Ore we look for fossils in. Well the boss instructed us(ME) to only bring 4 cars down the track at a time and after a couple of 4 car strings I took a string of 6 car's. Well the 1st brake was what we called a single, there wasn't another brake at hand on the next car so after locking the brakes on the 1st car with all wheels sliding on the track, i jumped down and was just getting on to the second car when i was knocked off that car by a wooden frame that was used for hay bales and the cars were now going to fast to stop! Well the Old timer that was pushing the loaded cars out of the load-out pocket was hard of hearing. When I yelled for him to get the rubber tired dozer out of the way he heard me on the 1st yell and almost got the dozer out of the way, but the cars took one of the rear wheels off the dozer and all 6 cars ended up on their side's! Well we had just got our overtime lunch delivered, however the boss invited us to eat the lunch at home that day! I thought that was the end of my job at the Hill annex Mine! (The overtime lunch at that time was a High Quality frozen dinner like a TV dinner but much much more and was called a "Taconite Dinner"). Well fortunately we both still had a job and were back to work that night. Car Riding was a good job, but as soon as one would take any part of that job for granted, bad things would start happening. One of my regular partners was a Native American that never worked on a pay day. When i asked why, well he said if he wasn't home when the check came he wouldn't see any of it. He and his wife lived a different life than what i and my wife lived. I remember one day when he was watching the parking lot. When he started laughing he held up the coil wire from his car. He had just bought a different car and his wife had came out to take it but couldn't get it started! My next job i was a successful applicant for was a driller. We would drill 12 inch holes 35 ft deep in a pattern of 40 Ft X 40 ft and that would vary from pattern to pattern. These holes were used to put explosive charges into the ore body and then touched off thereby breaking up the ore so the shovel's could load it, but more important to reduce the ore in size to run it through the benefaction Plant. The plant could only process ore 6 inches or smaller. The Drill at the Hill Annex was a very nice Bucyrus Erie 40R. This was not the drill I would run once I was trained in and had rights on. I would then get bumped to the Lind Greenway mine and run an old open air Churn Drill. There was no future in drilling for me and being restricted to a machine where one wouldn't see anyone during the shift wasn't my cup of tea. I remember one day all the trucks were pulled over and everyone was out pulling shovel cable during a shovel move and I got off the drill to help pull cable. The boss saw me and kind of told me in some strong words that my job was to DRILL! One of the critical things we watched for when drilling with a drill with high volume bailing air was the main air Gage! If the main air pressure started to climb we had to stop our down feed and clean the hole by running the steel drill stem up and down when necessary. It was know that a good driller wouldn't stick the bit in the hole! Well when one would start seeing the main air Gage when home in bed and wake up startling the wife, well that was another sign that drilling wasn't for me! I do remember being told after doubling out on the drill that i set a mine record of 1,000 ft in 16 hours. Back to car riding until the next job posting. In September of 1974 I got a posting for truck driver! Wow, now I would drive these HUGE Trucks! The 40 ton Euclid was the 1st truck i got to drive. This is the same truck as the one in the Pit today at the Park. These trucks have two GM 2 cycle 250 HP Diesel engines. Each engine powers a rear axle and one engine powers the air compressor for the brakes and starter the other the power steering. The pay load was 40 tons and the truck empty weighed just short of 60 tones. There were also 50 ton WABCO trucks and a couple 50 ton Cat trucks (Trucks here are rated by their payload). I just about tore my ring finger off when my wedding ring got hooked on the walkway of a Caterpillar Truck. With fortune the ring broke a chunk out before my finger came off. I have never had another ring since. Rings are forbidden on some mine property's today! I was bumped to the Lind Greenway mine during my 29 shifts driving trucks. At the Lind all the trucks were newer and were 60 ton Euclid's and we had to haul the ore up out of the pit to the screening pocket, unlike at the Hill Annex, we would dump the ore into A pocket down in the pit and the over size reject would be screened out and the rest would go up 3,000 ft of conveyor's to the Prep Section. While driving out of the Lind pit I read Louis L'Amour cowboy books to pass the time. I certainly am not a fast reader but would read a page before checking where the truck was going, it was that slow! Well again this wasn't my cup of tea and I was watching the bulletin board for new job postings. One of my younger brothers worked a couple years at the Hill Annex and drove truck. When he was layed off he spent the next 30+ years driving big rig trucks over the road. Truck driver was a job that had its very own level of boring that was without equal. I was always amazed that some people could spend 30 or more years doing the same thing! That isn't to mislead anyone to thinking truck driving wasn't dangerous. It was also Hot and Dusty! But for a guy that had what today is labeled ADD, driving a truck at 1-2 MPH was painful! In the late fall of 1974 I posted for Millwright. I would throughout the summer work as many extra shifts as a Millwright Helper especially on down day (the day the plant would be shut down for scheduled maintenance). All the guys that posted for Millwright then had to take a written test. We had to come in on a day off to take the test. I was lost when I took the test but they graded on a curve where years in mining required one to score higher or so i was told back then. to a pump and other such things. I remember walking into the Dry at the Lind Greenway mine and there was a guy I later came to be good friends with, but he asked me what I was doing here (at the Lind) and I said I am here to take a Millwright test. He said that he couldn't believe it and that I would never get the job because so many older miners were also testing for this job. Yes i was only 22 and had only worked in the mine 6 months but I told him that one shouldn't think about what others think and if one wants the job you have to give it your best try. Well the next time an opening came up for truck mechanic he posted and got the job. He was also hired on at Hibbing Taconite as a Auto Mechanic and retired from there a few years ago. Well I somehow passed the Millwright test that fall and when ore season ended I was laid off but only for a couple weeks and then called back as a Millwright. I worked in the Train shop and pit for the 1st couple months working with old Edgar White the Lead Man for shovel and drill repair (Bull Gang). There was almost always stripping being done in the winter but only a couple shovels were involved in that so we would repair the others. Then come the 1st of the year I was sent to the Heavy Media Plant for winter repair. We would rebuild wash down screens and sumps all over the plant. What a cold place to work in the winter! The only thing that made working livable was the warmth of the fellow workers! Those old timers I had the privilege of working with I give all the credit to for the success I had in the next 33 years and the great jobs I now have. 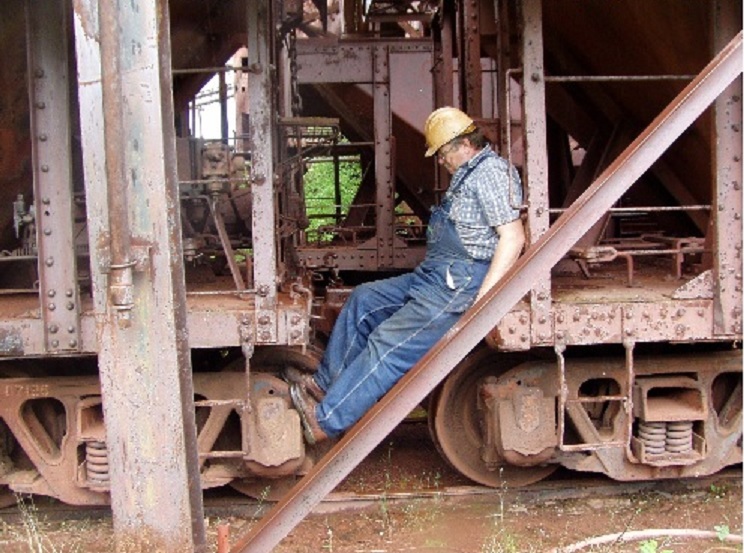 I look back to those years as the formative years of my life, a Taconite Miner. There was one other thing that kept those working in the ice cold of a Heavy Media Benefaction plant warm and that is a CalRod heater. This heater stands about 5 ft tall powered by 480 volt 3 phase power. You could find someone rotisserie in front of one just about any time except lunch break. In the ceiling of the plant is an overhead crane. I got assigned to run the crane often mostly because it was so cold and a long way from the heaters. Come spring we had a lot of large ice cycles falling from the plant roof. This made it dangerous to enter and exit the plant. Someone came up with the idea of running the overhead crane trolley into the stop blocks thereby shacking the whole plant. Then came the spring of 1975. I was hanging pipe for a new water line out to the Prep section and i got the call I was waiting for. My wife was in labor with our 1st of 3 children. Today as a tour guide I can walk right to that spot I was working when the call came in, of course the boss had to come get me to go find one of those old pulse dial phone back then like 40 years ago. Then the start of ore season. I and two other new millwrights along with one seasoned millwright, Orval Fogglequist, a wonderful guy that also came to work at the Taconite plant when the Hill Annex closed in 1978, and then he was the younger mechanic! We 4 worked the 20 shift rotation and when working afternoon and night shift were the only millwrights on the property. Anything that broke down except haul trucks, cats and loaders we had to work on. On a typical shift we would get all the conveyor belt scale readings, then wade through the ground floor called the basement and check all the pumps making any necessary belt or packing adjustments. We would then check in with the plant operators and address any issues they had, and the fines operators usually had a list! If anything came up we would be summoned by the operators or the foreman by 3 blasts of the plant emergency signal up on the roof. On midnight shift we would make a trip up onto the float reject pile checking the tracking of the conveyor and checking the "Stacker" this was the machine that is visible from miles away up on the edge of the pile and was made from an old churn drill. We would have to propel it one way or another to keep reject ore flowing over the edge of the pile. There would be 2 blast of the plant signal any time anything was started so no matter what we were working on we stepped away when we heard those 2 blasts. The Electrician was summoned with 4 blasts and 5 would be a fire or other emergency. One memorable night early in the shift I got the 3 blast summons and an excited foreman and plant operator. There was a tail pulley on the float reject conveyor where it leaves the plant with a smoking pillow block bearing of about 2-1/2 inches! The belt was also off tracking and it looked like the plant was going to have to be shut down for the night. I had never been faced with anything like this before and figured if I did it right the 1st time we might be able to keep running. I got a washdown hose and tied it down to keep things cool, then found a pneumatic grease pump and a 5 gal pail of grease. I set that up to pump real slow and then run the adjustment for the tail pulley back as far as I could. The belt was still off tracking but it wasn't rubbing anything so we run it through the night. The good part was they ran it over half way through the next shift until they got the parts ready for the repair. Today in the Taconite industry there is a huge high tech program of predictive maintenance. This program takes vibration readings on every bearing in the mine and everything is entered into the computer and a slight defect so small that a bearing might run for years before the defect developed to the point where failure is imminent would be tracked and when things start to develop the planning department would do its best to have all the necessary parts on hand and the repair would be made prior to catastrophic failure. Oil samples are also taken from all equipment mobile or fixed and the laboratory contracted would send reports with their best tracking information with a flag to indicate a problem is developing. On occasion there would be indications of a component facing iminent failure and the readings would say a motor coupling is failing and when the component was dis-assembled we would find it was the motor bearing and not the coupling. But the readings were good, just the interpetation would be a little off. When this program was 1st started we would tell the technition, a vendor that we could do the same thing with a forked willow branch. Of course that was just to pull his chain! :) The one thing that was always the case in a big Taconite plant, it was hard to get the supervision to seriously look into a pending problem to the point I used to say it would be better to have the guy that delivered the Buhl water tell the boss something needed attention than for one of us mechanics, to the point when vibration anallisis was 1st started in the plants we had a mechanic that would take the readings and he would then download the readings to an off the property service. Well the readings would be visable on the display of the data collection instrument. The operator would see the frequency modulation and recognize imminent failure. Well to be quite Frank, one doesn't need need a data collector when things get ready to schedual themselves and he would report the readings emphesising the severority of the problem. Joe R. was a wonderful co-worker who left us early when Cancer took him. Click here to continue this story.